I’m planning a Lorax party for my kids later this week to celebrate the release of The Lorax Movie (giveaway link) on March 2nd. My kids are (almost) 9 and 3 and they love it when I spend time with them crafting. Here are some of the projects (crafts and recipes) we’re going to be working on this week (thanks Pinterest for the inspiration). Lorax paper flower using an upcycled book. This would be a good use for a book that may be missing pages or damaged. via Etsy. This one is not an upcycled craft but I guess it could be if you pulled apart an old knit sweater and used the yarn for the project. It involves finger knitting and yarn pom poms, both simple enough for my oldest (perhaps a little too involved for my toddler). I saw a link to a video on Facebook yesterday but I can’t find it now so here is my own version of the tutorial for you. To make the Loarx bookmark from yarn I would suggest getting some really fun bright colored yarn. This was the only yarn I had on hand. Cut 2 pieces of yarn; the first being about 2-3 ft in length, the second being about 6-8 ft in length. The short piece will be the trunk of the Truffula tree and the long piece will be the pom pom. You’ll also need to pieces of yarn about 2-3″ in length. For the pom pom all you need to do is wrap it around 2 fingers (that are spread open) until you run out of yarn. Then take one of the short pieces and tie all the way around the wrapped spool on your fingers and tie a knot. This will form the center of the pom pom. Tie the second short piece around the middle as well. Then carefully take your scissors and cut open the looped pieces. You know have a pom pom. The more yarn you use the fuller your pom pom will be. For the trunk of the tree follow the steps in the video above and create a finger knitted trunk. You can make this any desired length that you like. Finally tie the pom pom to the trunk and knot. 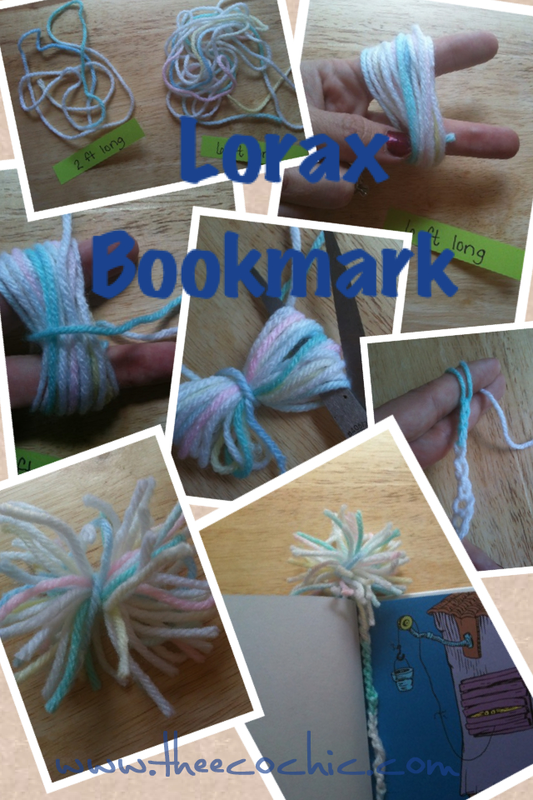 You know have your very own Truffula Tree bookmark. For more great Dr. Seuss and Lorax themed crafts, recipes, and more visit my Dr. Seuss Pinterest Board. Don’t forget to enter my Lorax giveaway too for a prize package valued at $75.